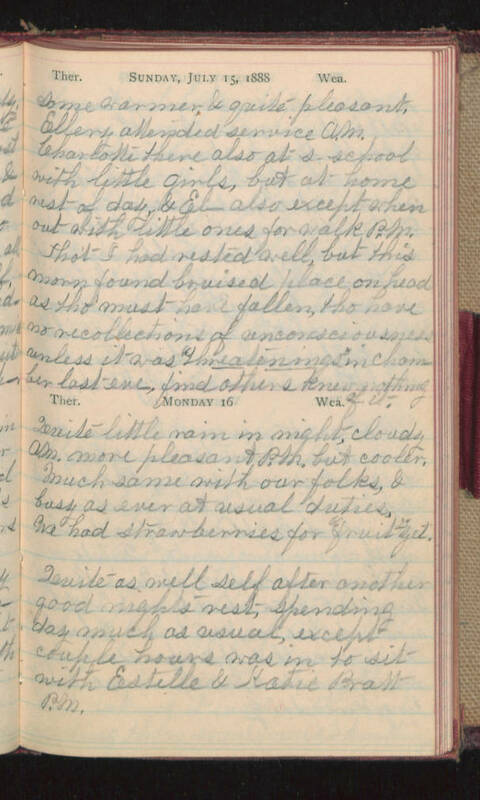 Sunday, July 15, 1888 Some warmer, & quite pleasant. Ellery attended service A.M. Charlotte there also at s-school with little girls, but at home rest of day, & El- also except when out with little ones for walk P.M. Tho't I had rested well, but this morn found bruised place on head as tho' must have fallen, tho' have no recollection of unconsciousness unless it was "threatenings" in chamber last eve, find others knew nothing of it. Monday 16 Quite little rain in night, cloudy A.M. more pleasant P.M. but cooler. Much same with our folks, & busy as ever at usual duties, We had strawberries for "fruit" yet. Quite as well self after another good night's rest, spending day much as usual, except couple hours was in to sit with Estelle & Katie Pratt P.M.